I'm looking at a 2006 Toyota 4Runner with 83,000 miles on it, and the dealer is replacing the rear wheel bearings. I\'m concerned with this repair having a domino effect on other drivetrain mechanics. What should I look for or ask for? Have 107K on ours since new. Zero problems. What does dealer think caused bearings to wear? Towing too much weight? I had that very model of 4Runner (in addition to 3 others). I abused that particular truck beyond anything even the craziest of off-roaders would consider to be reasonable and put over 300,000 on it. When I bought my new 4Runner I had no intention of trading it but the dealer basically pushed me into it because there was such a demand for that model. I got side swiped by a Honda Accord that hit me directly in the rear right wheel. Not long after the wheel bearing needed to be replaced. I went with a cheap $44 one, and it didn't last 10,000. I then went with a stock bearing and did over 100,000 on it (then I traded the truck). Unlike many other vehicles the wheel bearings on a 4Runner are independant of the hub, meaning you only need to replace the actual bearing and not the entire hub assembly. If a dealer even thought that there might be an issue with the bearings it would not be terribly expensive for them to do a replacement (especially if they had idle mechanics). I would have absolutely no fear buying that model with 83,000 on it, even if the bearings had been replaced. You will likely find it to be one of the most reliable vehicles you have ever owned. Thanks, guys. The dealer didn't mention what caused the bearings to go bad, but I'm going to look through the service record for this repair with a fine tooth comb. I don't want the bad bearings to have caused anything else, which is my main concern. 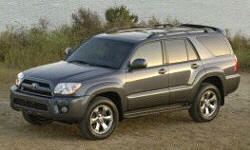 In general, not just in the 4Runner, wheel bearings are a relatively common and minor repair. They are susceptible to pothole damage. I wouldn't see this repair as cause for concern.